Hello everyone! Hope you are having a happy weekend so far!! 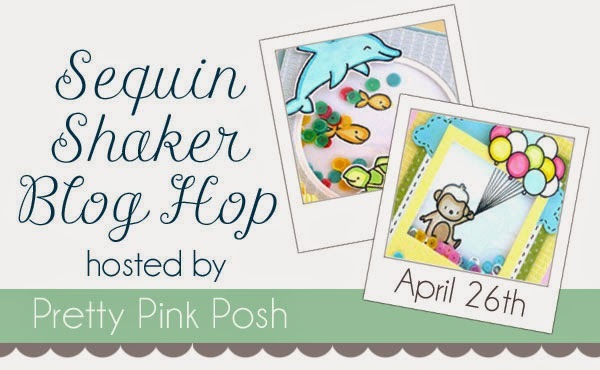 Today, I thought I would participate in the Pretty Pink Posh Sequin Shaker Blog Hop. 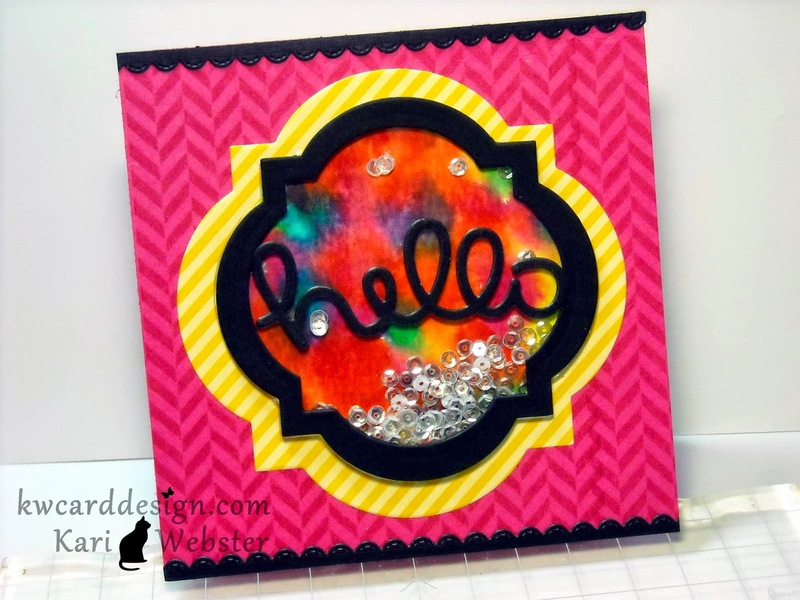 Honestly, I didn't think I would be able to participate because I have a busy weekend - mostly doing other craft things, but I just started making a sequin shaker, and loved how it turned out, so of course I didn't want to miss the opportunity to link my card up!! 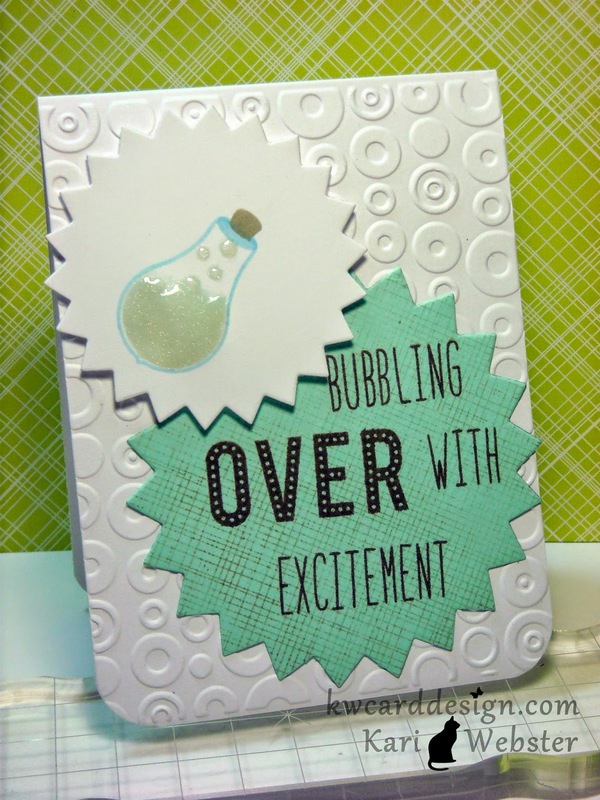 This is my card for the blog hop. It is a fun, vibrate colored card! 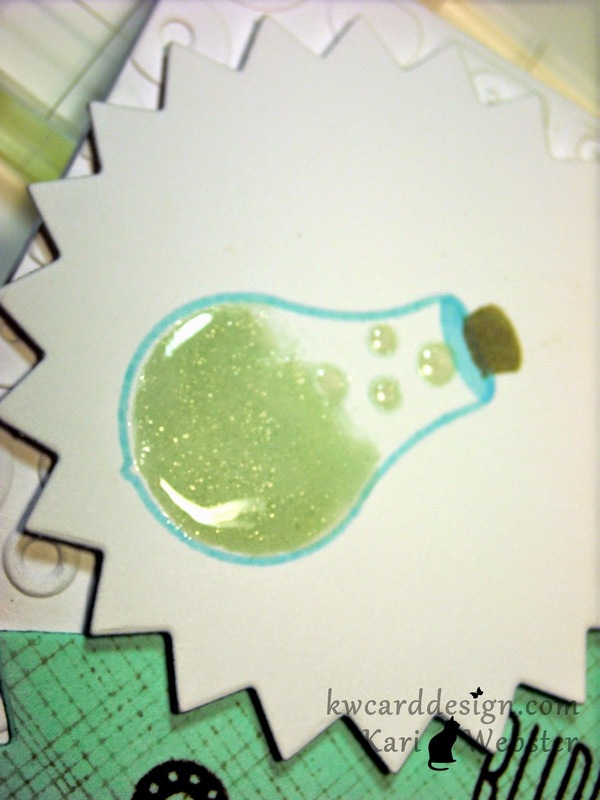 I started out taking some Tim Holtz Watercolor card stock, and I used a few colors of Distress Stains - and I applied them directly to my card stock. I added a bit of water to get the colors melding into one another, and I heat set it to speed up the drying time. I just loved how vibrate the colors turned out. I then took this piece and die cut it using some of my Framelits that I sadly do not remember the name of at the moment. I die cut also a piece of acetate, a piece of yellow patterned paper from the Let's Polka 6x6 pad from Lawn Fawn, and also a black frame using some Licorice card stock from Bazzill. I had to strategically place my foam adhesive around my die cut pieces as this is not a normal size for a shaker, but it worked out. Once I added my mm PPP Sparking Clear Sequins, I added my acetate, and then my black frame. I then adhered my shaker piece to the yellow patterned paper. I cut a piece of card stock and made my card base to be a 5 inch square card. I used a Hero Arts background stamp along with some Rose Bud Memento ink on my card base, and then die cut some black scallop borders using the LF Stitched Scallop Border Die. 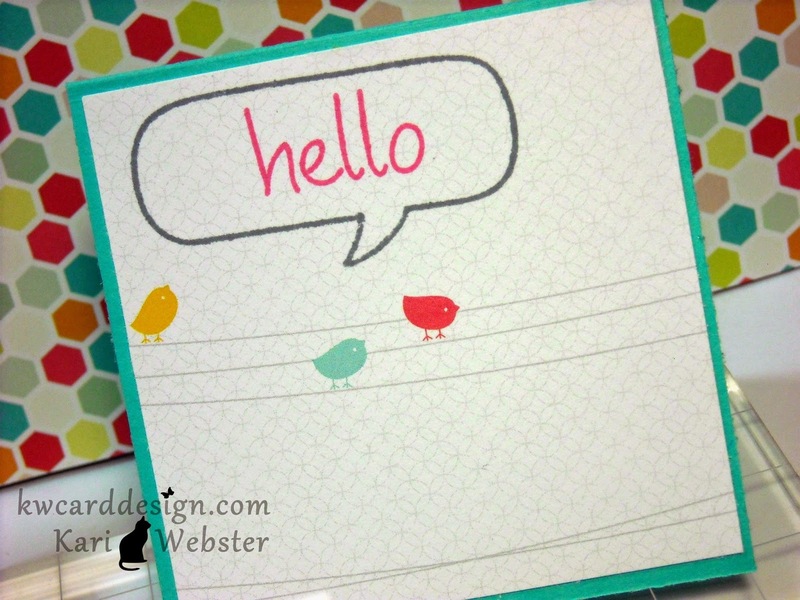 I adhered my shaker to my card base, and then I die cut the "Hello" sentiment using the Hello Die from LF and adhered it straight down in the middle of my shaker. I think it turned out better that I originally imagined! Hope you having fun either participating in the hop, or just looking at all the fun shakers and getting inspiration!! Hello everyone!! Welcome to April's Blog Hop with the FB Inspiration Team!! Our awesome sponsor is Spectrum Noir!! This month we are inspired by the colors Turquoise and Pale colors. You should have found your way to me by the lovely Sabine!! 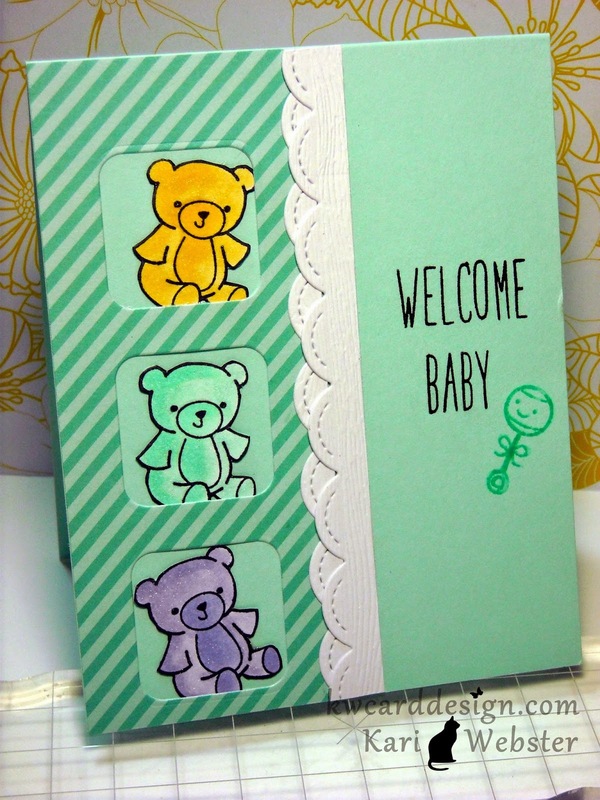 For my card, I made a baby themed card which I don't get to or don't often make! So, I made a conscience effort to make one! I used Pa Rum Pa Pum Pum, Plus One, and Milo's ABC's for my custom sentiment. 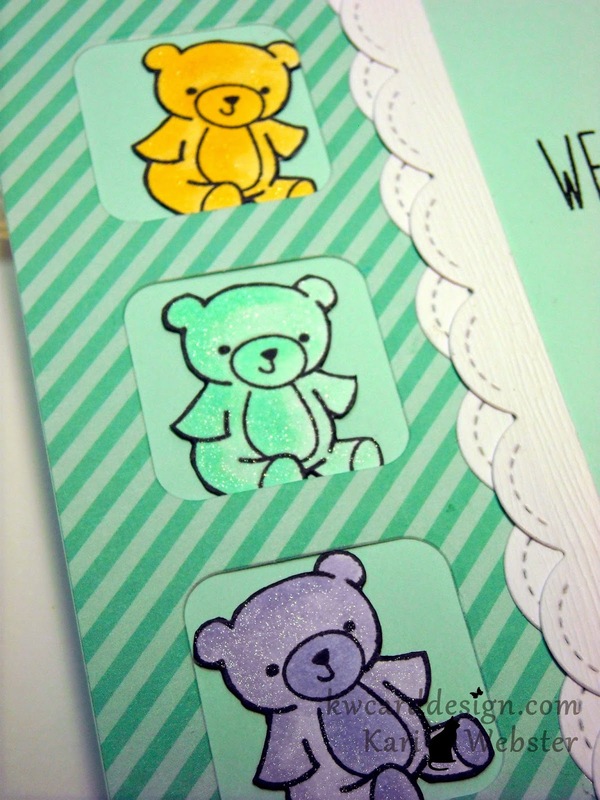 I stamped, and colored using the coordinating alcohol marker colors for this month's hop. I also used some pattern paper from the Let's Polka 6x6 from Lawn Fawn. I used the 3 square die from SSS, and also die cut some scallop borders with the Stitched Scallop border die from LF out of some wood grain textured card stock. Hope you are enjoying this month's hop! It is now time to continue to the awesome Lenny!! 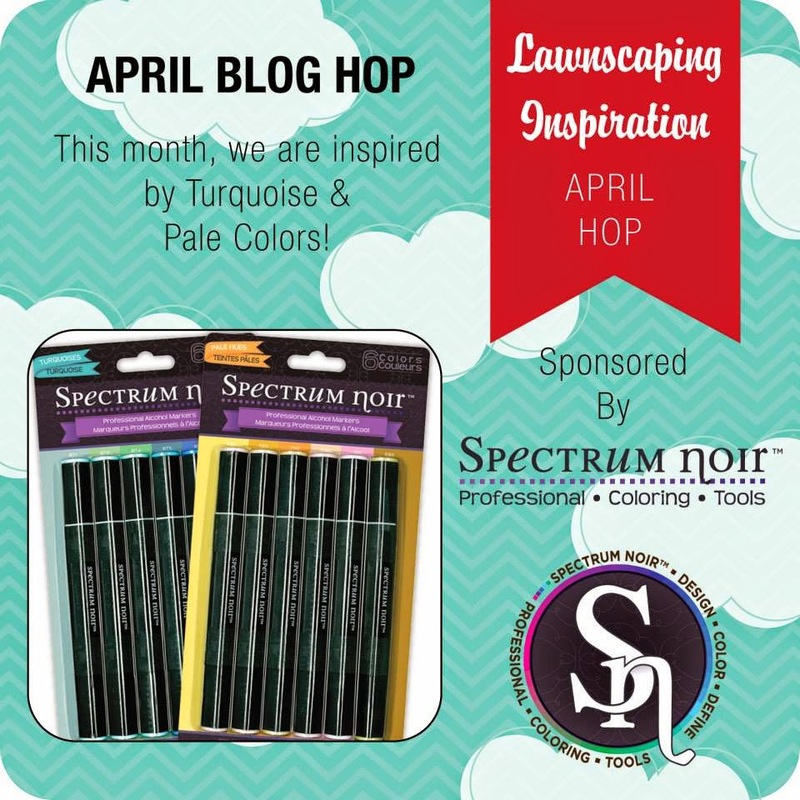 Be sure to leave comments along the way for your chance to win some Spectrum Noir markers!! Have fun on the rest of the hop!! Our wonderful sponsor is the wonderful and awesome Lawn Fawn!! I just made 3 3x3 cards - I used two stamp sets - So Much To Say and A Birdie Told Me. 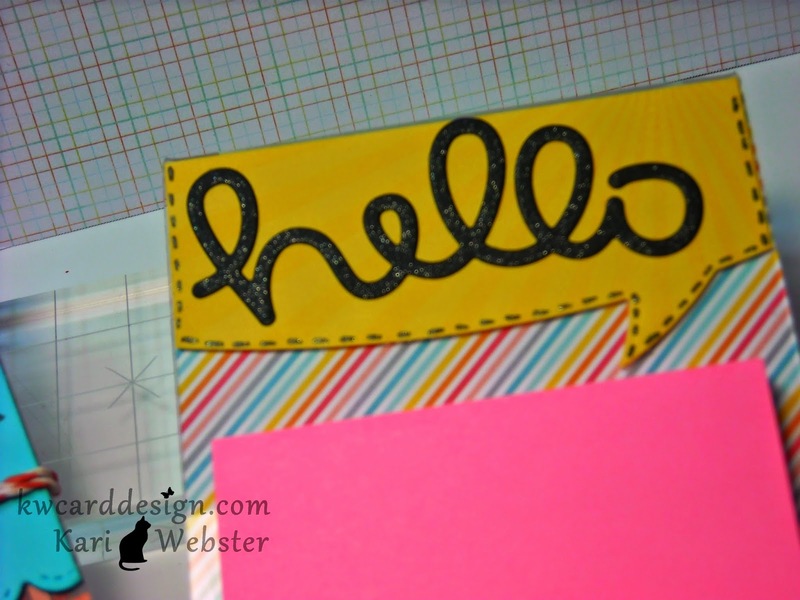 I also used papers from Let's Polka, and Hello, Sunshine. Looking forward to seeing all the mini creations in the gallery!! Have a great day!! HELLOO!! 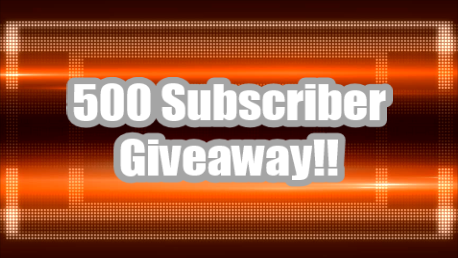 Today I wanted to announce my giveaway I have going over at my Youtube Channel!! I have hit 500 subscribers - my first big milestone and goal I set for myself for my channel!! I am giving away some craft goodies to say thank you!!! If you'd like to enter for the chance to win - head over to the video - and check out all the details in the description on how to enter!!! Thank you to everyone that has subscribed! I truly appreciate it, and YOU! Hello everyone! As crafters and stampers - when you start to experiment with your stamps, and the more you do, and come up with a design that gets you so excited, you can't wait to share it?? 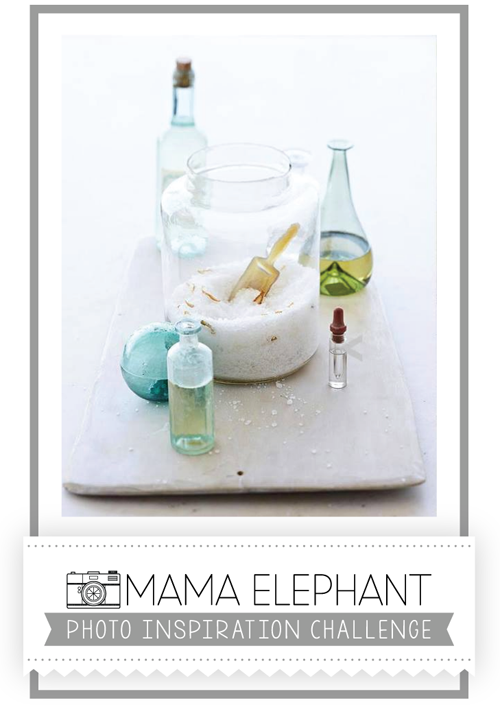 Well, this has happened a few times for me, but recently for the current Mama Elephant Challenge, I have had an idea brewing in my mind for a few days, and it was killing me that I had to put it off because work and other things had to take priority. Well, I was able to get some time this evening, and finish off my idea! I love how it turned out, and I hope that you all think that it is clever!! Here is my card, and below is the Inspiration Photo. Of course, I didn't have the right sentiment - so I stamped out my custom sentiment using Mama Elephant's Flashy Letter, and Lawn Fawn's Milo's ABC's. All the supplies used are linked below!! Such a fun challenge!! Hello, everyone! 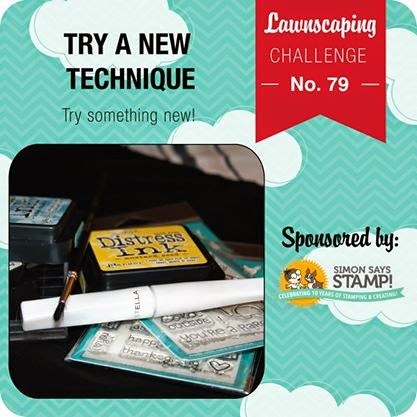 Please join me today over at the Lawnscaping Blog. I made some fun Post-it Note Holders that I know you'll wanna check out!! See you over at the blog!! 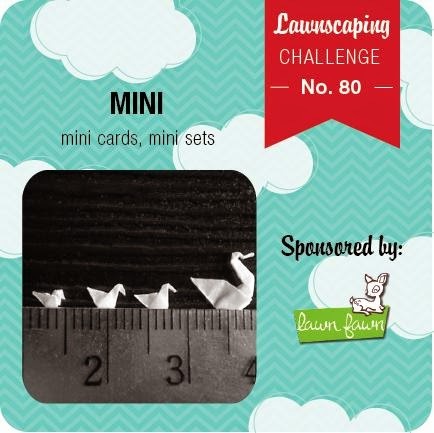 Welcome back to a new Lawnscaping Challenge! We are focusing on new techniques! Is there a technique that you haven't tried yet, and wanted to, or haven't? We'll for this challenge, we want you to try it! For me - believe it or not, I have never used my dies to emboss before! I have only used them to do what they were intended...die cut. 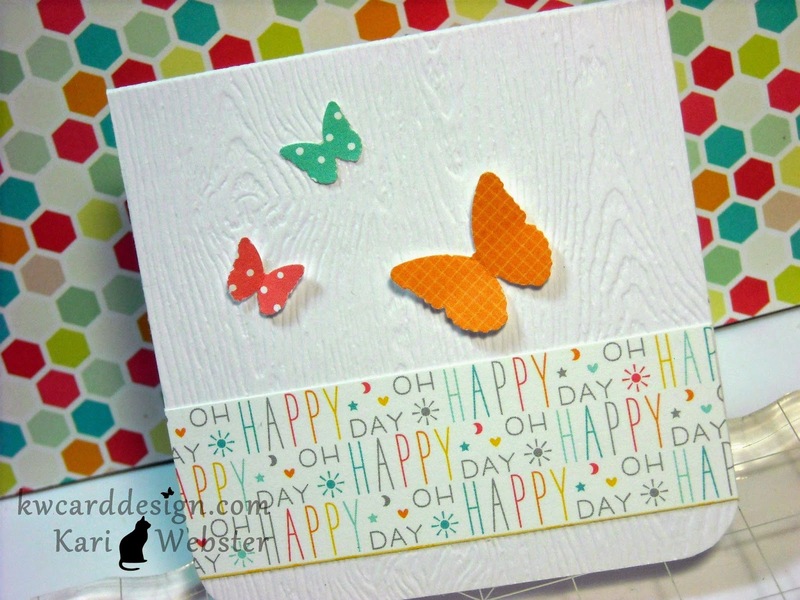 I have always wanted to try to emboss with dies - so that is what I did for my card. 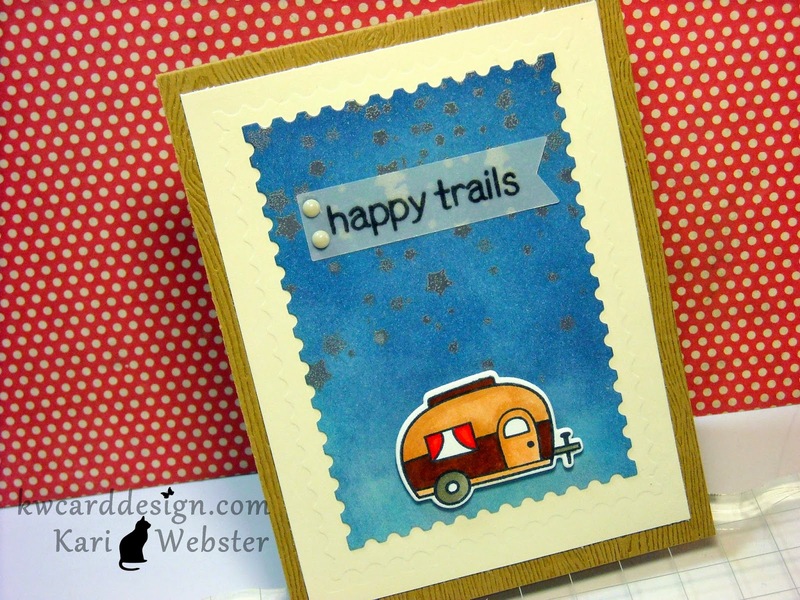 I used "Happy Trails" from Lawn Fawn for my card. I first die cut a piece of Bazzill Marshmallow ( my favorite) card stock using the one of the postage edge frame dies from Simon Says Stamp and I did some Distress Inking on the card stock to create a night sky. I used Tumbled Glass and a little Chipped Sapphire. I then took a star pattern stencil I have from Studio Calico, and I took my Versa Mark ink, and pressed it onto the stencil to create "sticky stars", and then I heat embossed it using silver embossing powder. I, then embossed another one of the postage edge frame dies onto a piece of Butter Mints card stock from Bazzill. I love how it gave it a subtle look. After that, I worked on my trailer - I stamped, and die cut it out and color it using some of my Copics. I created my card base which is 5.5 X 4.25 and scored it at the top from a piece of wood grain card stock from Simon Says Stamp, and I adhered both panels to the card base. I popped up my trailer using foam adhesive, and then I worked on my sentiment which is a piece of vellum, and I stamped my sentiment from the same stamp set in Versa Fine Onyx Black ink, and then applied some clear embossing powder since it is a pigment ink, and then I heat set that with my heat gun. I used a little of Tombo Mono Multi on the end of my vellum, and then I added two enamel dots to finish it off. 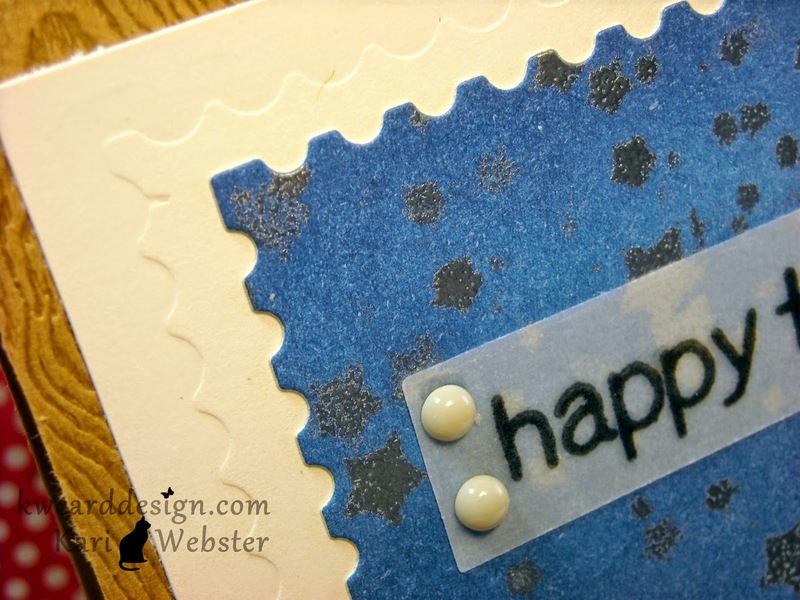 Here is a closer look at my embossing with my die. So - I am looking forward to seeing what techniques are used over at gallery!! Have fun creating, and I will see you there! Inspiration Sunday : Big Hugs for you!